Rustic, charming and homely, self catering holidays in the countryside. People repeat holidays that they recall fondly. People contribute to a holiday's success. There are two main groups of people that self-catering holidays suit, one is those who have dogs, the other is families. When a family also has a dog, self-catering cottage breaks are really the only sensible option of getting away. 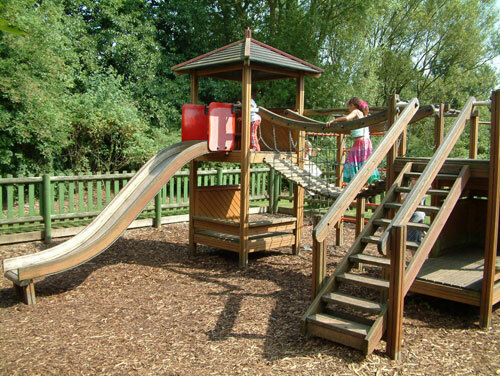 Children need space to play and holiday accommodation that is robust as well as comfortable and practical. It is also helpful to have a garden or suitable outdoor space for a dog. Holiday cottages and pine lodges are frequently designed to cater for families that have kids and a dog or two. They are usually located in a rural area, away from traffic, noise and congestion. What is needed is outdoor space, play areas, places for country walks with the dog and kids and yet near enough to some attractions such as parks, a beach, a zoo or soft-play centres. Staying in self-catering accommodation in a holiday park with lots of units of accommodation usually means that there are on-site entertainment facilities that appeal to children. All will have a swing park or adventure playground, perhaps a tree house, cycle paths, and a choice of other features: sand pit, paddling pool, swimming pool, tennis court, trampolines, outdoor chess, a soft-play area, a games room, pets corner. When travelling with dogs or young children, most people would like to keep the journey as short as possible. This translates into booking holidays within three hours driving distance at most. There are seaside towns, national parks and beautiful stretches of countryside within a three hour range of most people in Britain and a good choice of places to stay that are both pet and child friendly. Apart from providing sensible accommodation options, self-catering can be a budget holiday because families avoid paying for expensive meals and snacks out by cooking for themselves and making packed lunches to take on trips with them. They also have their very own kitchen and refrigerator that can be packed with drinks and nibbles that they can enjoy whenever they choose. Anyone with a family knows what is like on holiday with children. After a day out, it is lovely to be able to rest in the garden or in a private sitting room in front of the TV and not worry about keeping children’s excited chatter at a low level. There are no other guests to disturb in a family holiday home. Rent a cottage near a national park and run wild. The best of British dairy food and meat.